Well, I finally decided to get a tripod and now that I have been using it for a month or so the question is ... what took me so long? The Sony 70-400mm G2 telephoto is not especially heavy to carry, but lifting the camera and lens (just a shade over 5lbs) over and over again gets really tiresome. But, I can hand-hold pretty well and really didn't want to be bothered carrying and setting up a tripod all the time. It is true you are much more agile if you are hand-holding the camera, but you can learn to be fairly responsive with the tripod. In fact, I am learning a lot since I started regularly using the new set up. There are plenty of good tripods out there; I wanted something sturdy but light weight and was particularly concerned that I could easily operate the apparatus to adjust the height of the legs. I read a lot of reviews and learned most people buy cheap tripods at first and are disappointed. So, they buy a better one and it still isn't up to the job. Usually the third one provides the features they need. It seemed prudent to just skip the first two steps and spend the money for a good one. I learned carbon fiber material is much lighter, and clip-type adjustment levers are fast for extending the telescopic legs. So, I went over to Houston Camera Exchange to check out the Manfrotto MT190CXPRO3 tripod I had my eye on. I love ordering online, but sometimes you have to touch what you want to buy. And when the prices are the same, it is nice to support your local stores. We pay sales tax to Amazon here in Texas anyway. Now, that is just the first part. You have to have a head to connect your camera/lens to the tripod. Most tripods come with a ball head; it is OK, but I had seen Bill struggle with his and how happy he was once he got the Wimberly Gimbal head. I didn't need such a heavy-duty set up for my lighter telephoto lens; I got this amazing Jobu Jr. Gimbal head for me. 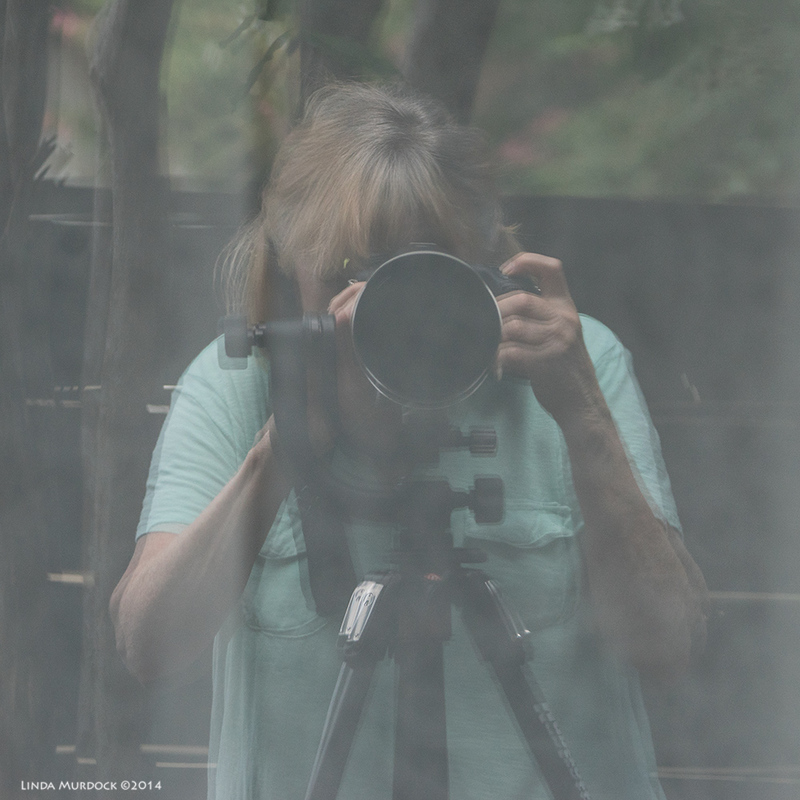 Linda's reflection selfie - I was looking at my sliding glass door from the garden. You also need a little quick-release plate that attaches to the tripod foot of your lens and then you can slide it into the gimbal head so it balances. Tighten it up and then you can pan and tilt and it will stay in that position. I am getting pretty good at setting up and breaking it down. So, what has she done with all these new toys? Brazos Bend State Park is a great place to see Golden Silk Orb-weaver spiders in August and September. Along the trail from the Observation Tower to Elm Lake there were dozens in webs spanning the trees on either side. They are large; maybe 2 inches from leg tip to tip. And, I thought this one was perfect until I got home and really looked at the image on my computer. Can you see the problem? By the way, this is a female. The male spider is much smaller. I would have never got this shot hand-holding my telephoto lens. With the tripod, I was able to use the 2 second timer and a really slow shutter speed. Spiders don't move much. And then one day we had been all over looking for birds. It was hot, humid, sunny and what birds we did find were backlighted, scraggly or too faraway and/or facing the wrong way. Desperation sent us to the Quintana Neotropical Bird Sanctuary just in case there was something interesting. And there were dragonflies all over! Dragonflies are great subjects if they will just light somewhere; I haven't had any luck getting one in flight. Often times they will fly off, but return to the same perch, so patience is rewarded. The tripod makes this so much easier. This Roseate Skimmer above has been heavily cropped, but the focus on his head is sharp. And look at those barbs on his legs! Female or young male Eastern Pondhawk with lunch! Eastern Pondhawks are so common, I don't notice them much unless the background is interesting or they are doing something special. And this one was! She is eating something that looks a lot like what we always called June Bugs, little brown beetles that are attracted to your porch lights. I didn't get a better photo of her prey, but it is a big reminder dragonflies are predators. They do not live on nectar. But what about birds? Is the tripod helpful for the birds? True, you are not as mobile but sometimes the birds are predictable. This Spotted Sandpiper was feeding among the rocks at Quintana Jetty. Generally they will poke around in the rocks, traveling in one direction for a good while. Then, they often turn and travel back looking for new food washed up by the waves. This handsome fellow still has his breeding plumage (all those fancy spots) and is returning to the coast from the Arctic Tundra (AKA Canada). They spend the winter with us, or travel further south, with a plain white breast and belly. But what about BIFs (Bird in Flight) with the tripod? At the Quintana Jetty you are a bit above the water level. It was good practice to follow the Neotropic Cormorants coming up and taking off across the water. Brown Pelicans also are good subject as their flight is fairly predictable. All in all, the tripod and gimbal head are a good investment. And now that I am comfortable with it... I wonder why I waited so long! Do you do that? Do you keep doing things the hard way just because you are stubborn? Are you open to changes in your habits? Or maybe you are an early adopter and have all the latest shiny toys?